Agriculture may do better this year than expected, researchers say. But at a long-term cost. 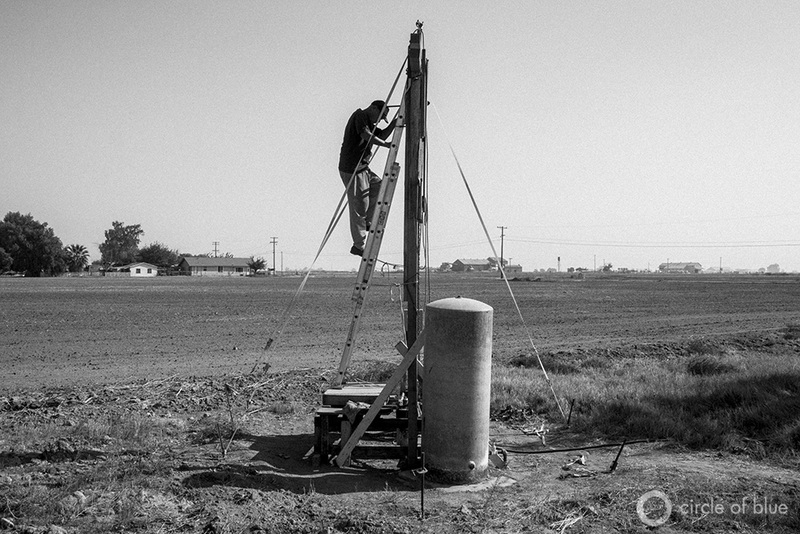 Dropping water tables in Stratford, California, and a shorted pump resulted in Louis Coronado’s water well going dry. Because professional drillers were busy drilling new wells for other area farmers, Coronado built this scaffolding and repaired the well himself. Click image to enlarge. Amid a record-smashing drought in which every acre of California is parched and toasted comes a report with an intriguing though not entirely astonishing conclusion. The Central Valley, the nation’s most valuable farming region, will not, as a whole, fare as poorly this year as once thought, thanks to a crop-saving but endangered resource: groundwater. This is according to researchers at the University of California, Davis, who forecast that farmers in 20 Central Valley counties will cover 75 percent of the expected water shortfall in canal deliveries by pumping additional supplies from aquifers. Tapping those groundwater reserves will rescue many farmers from economic ruin, but drawing so deeply from the aquifers will increase a longstanding annual water debt. As the valley’s water table plunges, future droughts may be more difficult to survive. Because California’s reservoirs are so low, the water delivered by state and federal canals will be cut by roughly 8 billion cubic meters (6.5 million acre-feet) in 2014. Some farm districts in the Central Valley will receive no canal water at all. So they pump. Operating at full well-pumping capacity, farmers will draw 6 billion cubic meters (5 million acre-feet) to the surface this year, according to the report. More than 60 percent of the pumping will occur in the southern third of the valley, where aquifers today are as much as 30 meters (100 feet) below record lows. Even with the supplemental groundwater, many fields will go unplanted, though not as many as feared. The report forecasts that some 410,000 acres – mostly of hay and grains – will be fallowed because of a lack of water, down by half from an estimate made in March by a farm lobby group, which surveyed water district managers. Revenue losses under the new forecast would be $US 738 million in the Central Valley, a drop of roughly 3 percent compared to an average year. Effects on the dairy and livestock industries, however, were not taken into account because the economic models used for the study assessed only crop production. The researchers calculated job losses for two categories: those working on the farm and those working in related industries such as trucking and packing. Some 6,400 farm jobs would disappear, and 14,500 jobs total. The overall economic loss in the Central Valley would be $US 1.7 billion. The report’s conclusions are not surprising because they follow a precedent. California farmers, like many in the business, often rely on aquifers to endure drought. An analysis of California’s 2007 to 2009 drought by the Pacific Institute found that groundwater was an essential coping tool. For instance, Westlands Water District, a particularly vulnerable patch of land on the west side of the San Joaquin Valley, pumped 19 times more groundwater in 2009, when 270,000 acres in the valley were fallowed, than in 2006, a wet year. The ebbs and flows in pumping would be tolerable if they were balanced. But they are not. Significantly more water is taken out of aquifers during dry years than filters into the ground during the deluges. Satellite measurements show a net loss of 50 billion cubic meters (40 million acre-feet) of groundwater in California between 2003 and 2013 – almost twice the water in Lake Mead, the nation’s largest reservoir. Severe consequences result from aquifer depletion. The land flattens like a deflated soufflé, threatening to crack apart the very canals that tie the state’s water system together. The loss of mass in the valley – because water is heavy – causes the Sierra Nevada range to rise up, a geomorphic rebound effect that could facilitate earthquakes along the San Andreas fault. Rivers can dry up. As the water table drops, the cost to access that water goes up. The report estimates that farmers will spend an additional $US 488 million this year on the energy to pump groundwater. Jay Lund, a co-author of the report, told Circle of Blue that a follow-up study due in July will assess the economic cost of these negative consequences of groundwater depletion. He would not identify any specific items in the next report. For all these reasons, groundwater reform is a top priority for Governor Jerry Brown. Earlier this month, a state-appointed task force released a set of management recommendations. Local control is the buzzword, though local control to this point has led to depletion in the Central Valley. Two of the recommendations suggest the creation of local regulatory agencies and enforceable targets for groundwater use. But change does not come quickly. The document envisions a five-year process to set the targets.